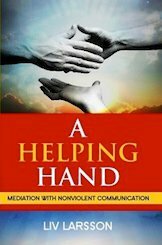 This book, step by step, teaches you how to become an effective mediator, whether you are a parent, teacher, business manager, counselor or peace worker. Is it possible to help other people solve their conflicts without getting sucked in you yourself? Yes! This book, step by step, teaches you how to become an effective mediator, whether you are a parent, teacher, business manager, counselor or peace worker. You will also get a good foundation in NVC, on which this very down-to-earth approach to mediation is based, and lots of answers to practical questions. Liv Larsson is an experienced trainer who has taught peacemakers in violent conflicts in Thailand and Sri Lanka (and to many others in Western countries) and who applies the very same skills to solve conflicts in her family!